Kimble County Sheriff Hilario Cantu said crews resumed their search Wednesday morning for four people missing since a recreational vehicle park was overrun early Monday by raging floodwaters that prompted dramatic air and water rescues in a small West Texas city. Heavy rain Sunday night caused the South Llano River to rise and submerge parts of Junction, about 140 miles (225 kilometers) west of Austin. Emergency crews looked for the four Monday, but abandoned the search as darkness fell and more rain set in. 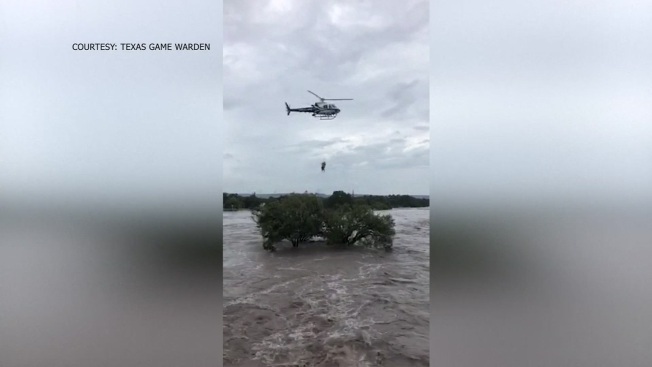 Texas Game Warden Rachel Kellner said Tuesday afternoon that swift-water boats were patrolling a 35-mile (56-kilometer) stretch of the river downstream from the RV park located on the South Llano River in Junction. "There's a lot of brush, there's a lot of tree line, so they're slowing down and hopefully if there's anybody that's hung up on a bank or in a tree, they can at least hear them," said Kellner. Wednesday's search inlcuded dogs and drones. 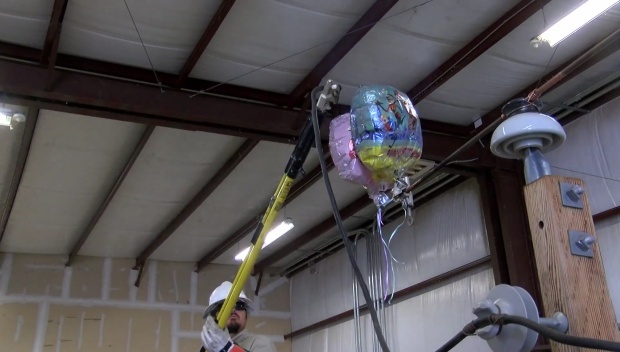 A Texas power company is warning of the dangers and consequences of releasing mylar balloons into the air and when they come in contact with power lines. Kellner said the one woman and three men missing are coworkers. Officials on Monday said all four missing were men. She said there were no other people known to be missing. Right after the RV park was overtaken with water Monday, officials were able to rescue about 40 people by throwing them life jackets or ropes. But then the water got too high and they needed helicopters and boats for the rescues. Authorities rescued 15 by boat and four by helicopter Monday, including, Kellner said, two people and a dog who were plucked from a tree. She said one woman floated about 18 miles (28 kilometers) down the river on debris before being rescued. She only sustained cuts and bruises. National Weather Service meteorologist Stephen Harrison said more than 12 inches (30 centimeters) of rain has fallen in the area since Sunday and that more is expected. "There's still the possibility some more flooding could occur in that area," Harrison said Tuesday, adding that the afternoon was forecast to be dry. Jamie McDonald captured one of the helicopter rescues on camera outside his hotel. McDonald, also known as "Adventureman," is an author and motivational speaker and was visiting the city as he runs across America to raise money for children's hospitals. 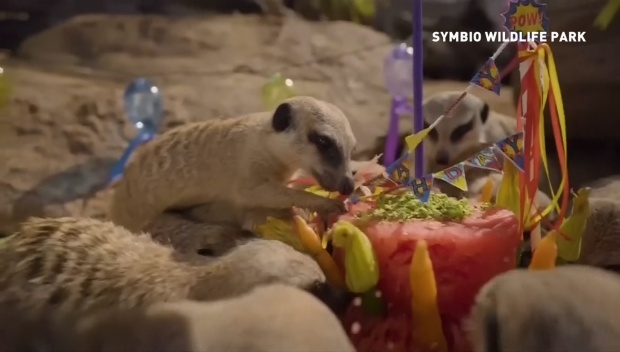 Meerkat quadruplets at a wildlife park in Australia have celebrated their first birthday with a cake smash party. The cake made from watermelon, zucchini, baby carrots and broccoli was devoured in minutes, according to the park. McDonald said he heard people shouting and screaming and opened the hotel room door. He found people on the balcony and saw a man in the water holding onto a tree. "There was one guy just clinging on to dear life," he said in an interview Monday, describing the scene as "heartbreaking." At one point, McDonald said the man became separated from a tree and it was uncertain whether he would make it out OK because the current was so strong. McDonald's footage shows onlookers worrying from afar. "Get a hold of something," one person says. "God help him please," another says. Later, the man was hoisted up from the water by helicopter and safely lowered down to a parking lot, McDonald said. He said the man, who was naked, appeared bruised and battered. 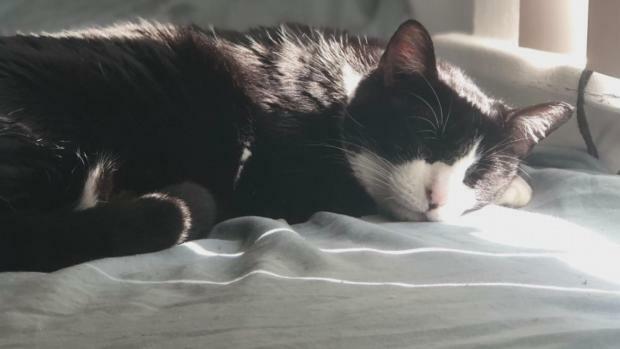 "I can't believe they actually rescued him," McDonald says on the video. "That was incredible, just amazing support." Associated Press reporter Ken Miller contributed to this report.